JVI Vibratory Tube Feeders are used to horizontally convey material at a controlled feed-rate through a fully enclosed environment. 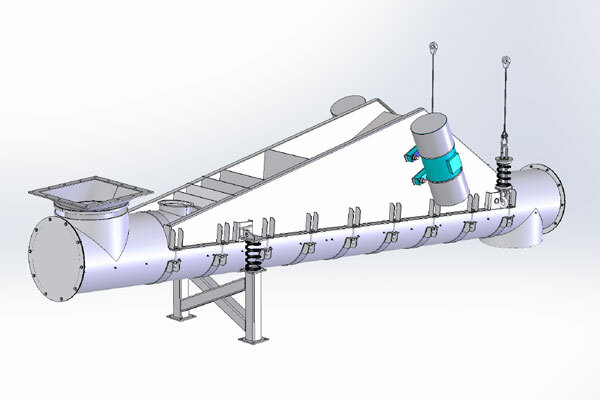 Vibratory Tube Feeders are the optimal conveying solution for applications that have stringent sanitary or dust control requirements. These machines utilize a gentle conveying action that results in nearly no degradation of the conveyed material. JVI Vibratory Tube Feeders are available in a variety of construction materials to best suit your requirements. Dust tight inspection covers and hatches allow access for easy cleanout. The UTF is ideal for closed, dust-tight applications. Additional inspection clean out hatches can be added to the UTF for ease of maintenance. An inlet and outlet socket with dust-tight collar is also an option for the UTF model in applications where dust management is a concern.